MOSCOW (Sputnik) - The Organization for the Prohibition of Chemical Weapons (OPCW) is doomed unless the decision to expand the organization's powers by allowing it to attribute responsibility for chemical attacks is reconsidered, Russia's envoy to the OPCW Alexander Shulgin told Sputnik. "It [the decision] was adopted by a minority. We have made it clear that we will not execute it and will do everything possible to rectify the situation. 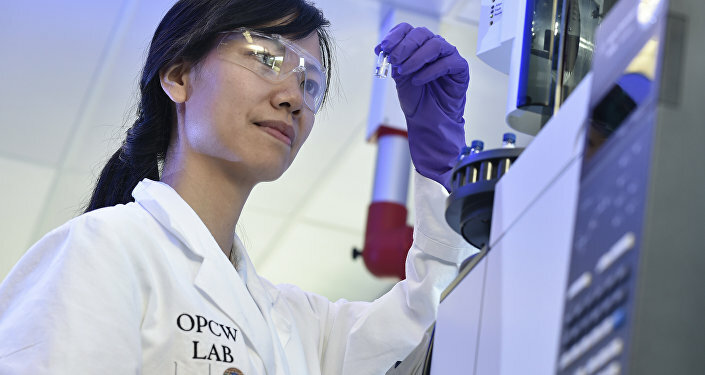 If the situation cannot be fixed, the days of the OPCW are numbered, at least as far as its truly universal character is concerned," Shulgin said. The envoy noted that the OPCW Technical Secretariat needed reforms. "It is necessary to change a lot in the work of the technical secretariat of the OPCW, to ensure that the Fact-Finding Mission in the use of chemical weapons is staffed on the basis of the principle of fair geographical representation, so that there are representatives of all regions and not only representatives of the Western group from those countries that are knowingly hostile to the legitimate Syrian authorities and to President [Bashar] Assad," Shulgin said. Russia will by any means fight attempts to expand the Organization for the Prohibition of Chemical Weapons (OPCW) powers by giving it the right to attribute blame for chemical weapons attacks, Russia's envoy to the OPCW said. "Any attributive functions in the OPCW, delegating the [OPCW] Technical Secretariat functions of identifying perpetrators behind the use of chemical weapons is a direct encroachment on the UN Security Council's prerogative," Shulgin added. Russia submitted written questions to the Fact-Finding Mission (FFM) on Syria of the Organization for the Prohibition of Chemical Weapons (OPCW), but received no answers, which reinforced the feeling that the mission might be guided by double standards, Shulgin stated. "[We] submitted [questions], expecting to receive some clear answers the following day. Unfortunately, we received no answers even on the following day. A feeling that the mission is guided by some sort of double standards in its work grew stronger," Shulgin said. The envoy to OPCW said that the mission appeared to trust Syrian armed militants implicitly, but seemed extremely skeptical of any information provided by the Syrian government and the Russian military. Shulgin explained that Russia decided to send the questions in writing after it became clear during the special briefing that the mission representative could not answer on the spot. The Organization for the Prohibition of Chemical Weapons (OPCW) Fact-Finding Mission (FFM) to Syria is biased, it blindly follows orders of the Western member states and Moscow will fight to change that, Shulgin said. "The FFM obediently types everything that the representatives of the Western group suggest. We will seek a radical change in the situation in the [OPCW] technical secretariat," Shulgin said. The Organization for the Prohibition of Chemical Weapons (OPCW) Fact-Finding Mission (FFM) final report on the alleged April chemical attack in the Syrian Douma will be published in one or two weeks, envoy said. "We will demand a comprehensive review [of the preliminary report], we will pay attention to inconsistencies, gaps in the conduct of such an investigation. The truth must be established… It [publication of the final report] was promised in two or three weeks, but no one can say anything precise," Shulgin said adding that he was told that on July 13. The envoy pointed out that the report did not mention that the OPCW mission which, was about to set out for Syria to look into the incident had to stay in Beirut so as not be hit by the strikes. On July 6, the OPCW Fact-Finding Mission said in a report that the investigators found no traces of nerve agents in the environmental samples or samples collected from alleged casualties of April's reported chemical weapons attack in Douma. At the same time, OPCW experts said they had found traces of organic substances containing chlorine, along with explosive residues. The FFM pledged to continue its work to draw final conclusions. The United States, the United Kingdom and France launched over 100 missiles at various targets in Syria a week after an alleged chemical attack in Douma on April 7, which they blamed on the Syrian government. The Syrian government refuted the allegations.